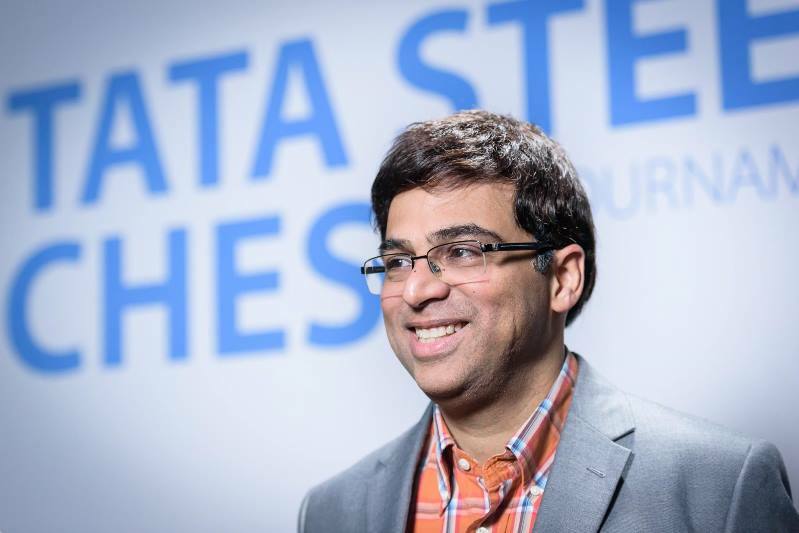 Ian Nepomniachtchi and Vishy Anand crushed Dutch stars Anish Giri and Jorden van Foreest with Black to lead after Round 1 of the 2019 Tata Steel Masters. 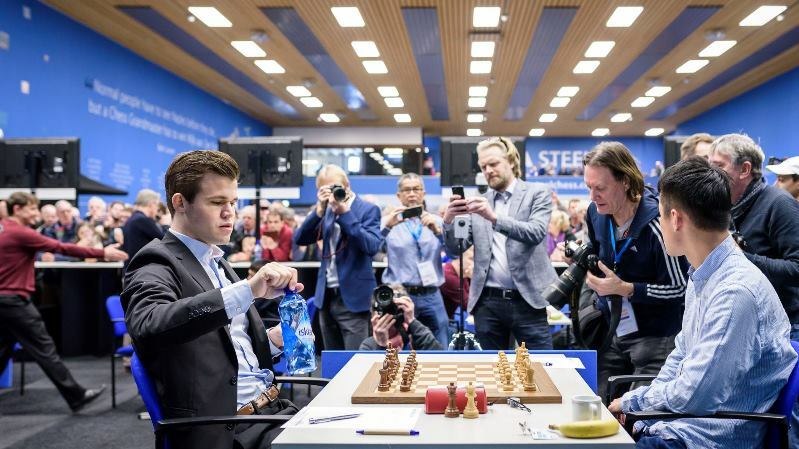 The other games were drawn, but every single one was a fight, with Peter Svidler describing Ding Liren-Carlsen as “one of the more interesting and original games of chess I have seen at the top level in a while.” Elsewhere Jan-Krzysztof Duda and Sam Shankland pushed Vidit and Shakhriyar Mamedyarov all the way, while Teimour Radjabov missed a golden chance to grab his first ever classical win against Vladimir Kramnik. I think 10…Nc6 was perhaps a bit overzealous. I just was so attracted to the idea of having all this central control and shutting his bishop out, but perhaps that wasn’t quite correct, and I feel like in the subsequent fight I was the one who was always kind of fighting for my life. 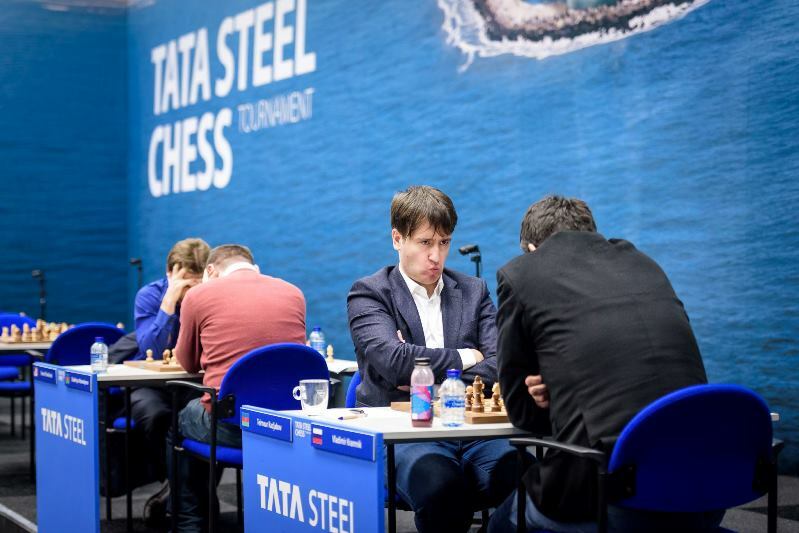 It did indeed prove a tough start for Jorden van Foreest, whose opponent, former World Champion Vishy Anand, is 30 years older and, by his count, was playing in his 19th top event in Wijk aan Zee. Vishy played the Caro-Kann and after 16…Nxd6 was happy with his position – “I felt that my pieces are fluid”. Just 5 moves later it was essentially over, as Jorden admitted to having overlooked 21…f4! There are only two colours in chess, and there will be a trend this way and there will be a trend that way. I think this is essentially meaningless, these trends. 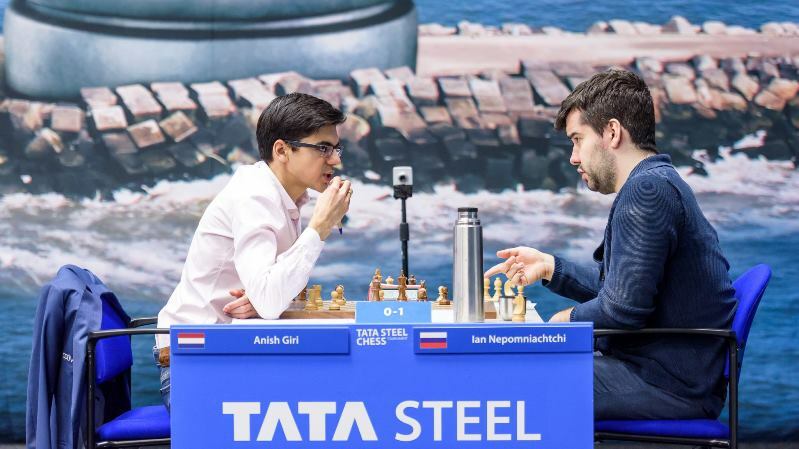 If an early loss for Jorden was no surprise, it was a real shocker not just that Anish Giri lost, but how – Ian Nepomniachtchi had the black pieces, played the Pirc Defence and won in just 26 moves! Playing the Pirc in a game which isn’t a must-win can be considered provocative at the top level, so why had Nepo done it? Well, he told a story! The usual citizen has his own day. So in the morning he goes to work, sees his children, he hugs his wife. But some professional chess players they begin their day with analysing the Najdorf or Berlin. 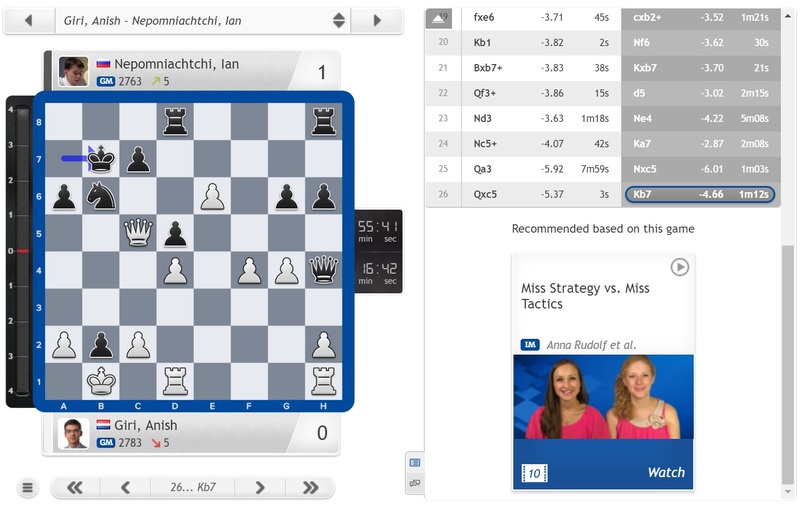 So I just decided – come on, maybe Anish will analyse some Najdorf once again, and maybe he did this every day for the last week, and I was just too afraid to go to the Najdorf, and that’s it! The piece sacrifice 18.exf5? caught Nepo by surprise, but it was a good surprise: “this idea exf5 never seemed to me like something real, but when he suddenly decided to go for it at least I wasn’t disappointed”. He took under three minutes to accept with 18…bxc3 and the game lasted only another 8 moves before Anish chose to resign. It seems even our recommendation system was trolling him after the start he’d made to the event! 18…Bd3!, and the bishop is immune due to 19.Qxd3 Rxa1 20.Rxa1 Bxh2+. After 19.Qd2 Rxa1 20.Rxa1 Black was in control, but although Duda played the upcoming endgame impressively he couldn’t quite squeeze a win out of a position with an extra pawn. 28.Bf5!? would actually be a winning move, except that the main line is just a draw: 28…gxf5! 29.Bxf6 fxg4 30.hxg4 Nxf6 31.Qg5+ Kf8 32.Qxf6 Qxg4 33.Qxd6+ and perpetual check soon followed. Objectively speaking other less spectacular moves would have been stronger for White, but although the computer likes White’s big space advantage it’s unclear if there would have been any practical winning chances. 50.Kd5!, with the c5-pawn defenceless, was the move, just as it was on moves 46, 47 and 49. Sam perhaps feared a race on opposite flanks, though it seems it would have been one in which he had a headstart. Instead after 50.Rf3 Bc6 51.Rf1 Rd8 the door had finally shut and the players repeated moves. Of course a draw against the world no. 3 isn’t a bad result for your elite round-robin debut, but there might have been more for the US star. 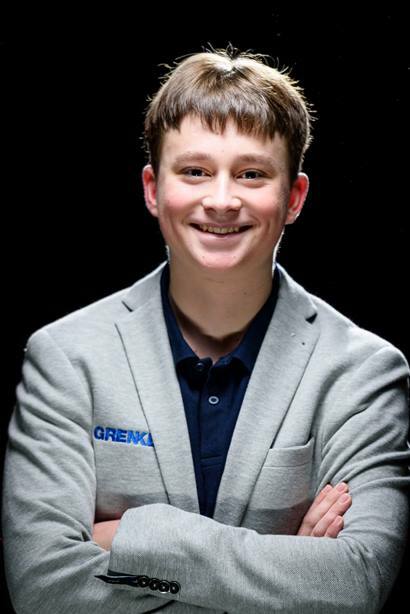 Teimour Radjabov has found Vladimir Kramnik to be a tough opponent. 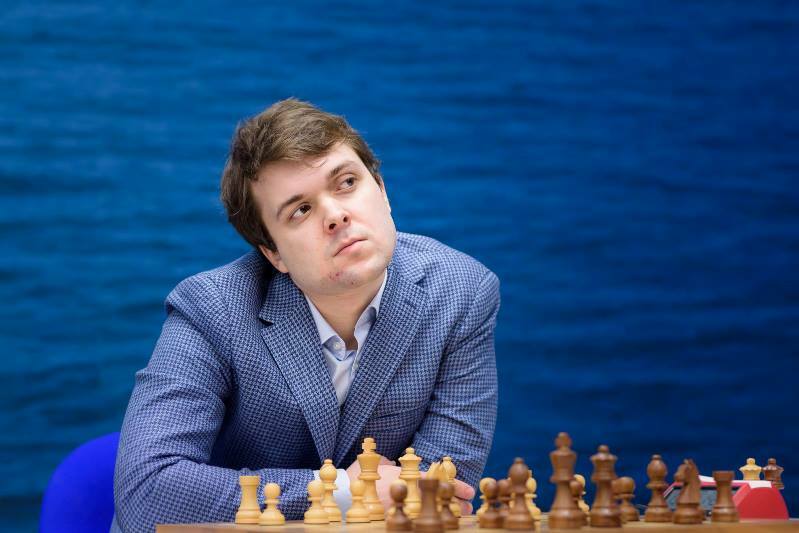 He’s lost four classical games, won none, and was memorably beaten by Kramnik in the 2011 Candidates Matches in Kazan. Back then Kramnik managed to win an objectively drawn position after a blitz game had to be stopped because the clock broke. In Wijk aan Zee it looked as though Radjabov’s work with Vladimir Chuchelov had paid off as he got a lingering edge in a Giuoco Piano. Then it looked as though the game would nevertheless end in a draw as Vlad had found a way to encourage a repetition of moves by shuffling his knight between d7 and f6. Kramnik has changed a lot since 2011, though, and he had no interest in a draw! 39…Rexe7 40.Qf5+! would indeed be a clear win, but Radjabov had missed 39…Ra4! !, played by Kramnik with 5 seconds left on his clock. At first it looks like a trivial win for White, but after 40.Rxa4? Qxa4 41.Qxe8?! Qe4+ it turns out Black forces a draw by perpetual check, two pieces down. It was a failure for Teimour that we got to see that demonstrated on the board, since if he’d just moved the rook away from the a-file on move 40 (e.g. 40.Rc1) he would still have been much better with an extra 50 minutes to work out a win. The problem was he had just a minute and a half to take that decision. Then later, even on move 41, White could have chosen to play on, though there would have been a long road ahead to try and squeeze out a win. 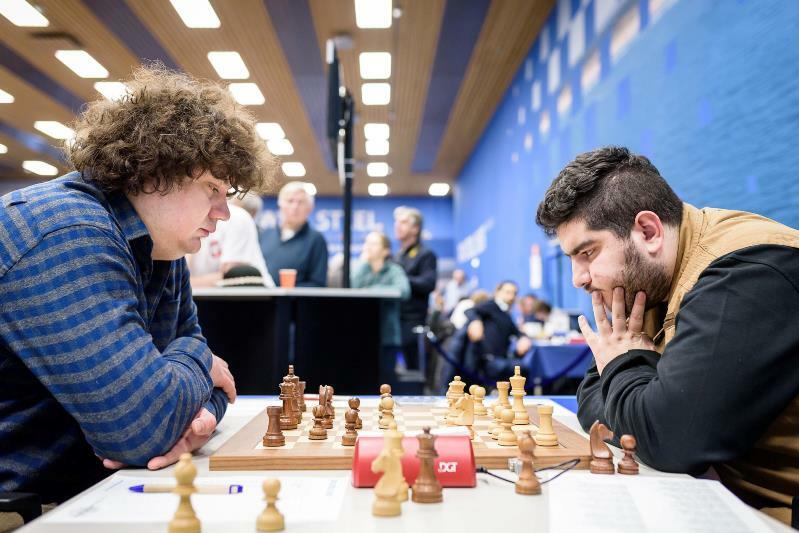 Top seed Anton Korobov gave World Junior Champion and Challengers rival Parham Maghsoodloo a free lesson on playing the Najdorf on Saturday, with the 18-year-old no doubt regretting the tempo he lost with 18.Kh1? 14-year-old Vincent Keymer survived against German compatriot Elisabeth Paehtz, although the computer assessed the final position as winning for the latter. It seems that wasn’t the only fire taking place during the contest! 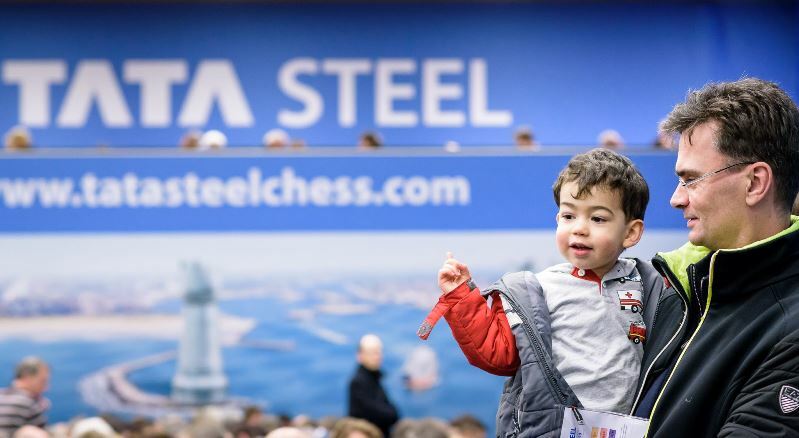 There are some big games to look out for in Sunday’s Round 2 of the Tata Steel Masters. 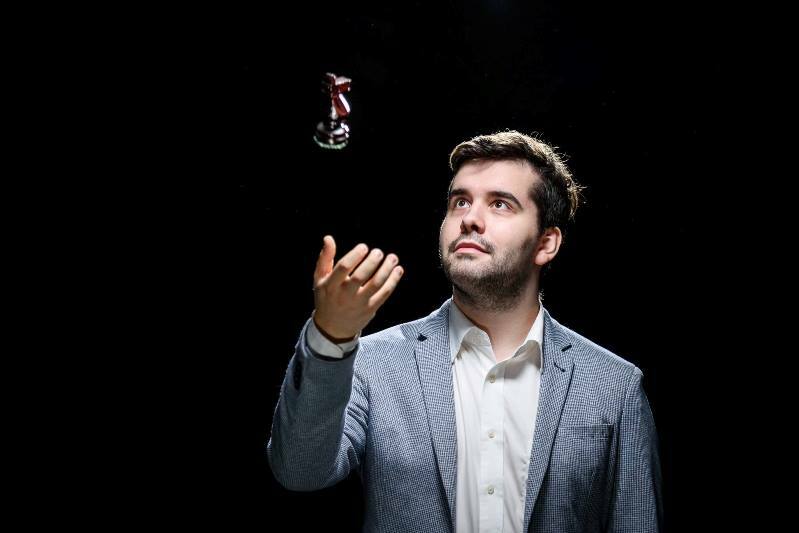 Can Carlsen do something about his 0 wins, 4 losses classical record against Ian Nepomniachtchi? (Jan: “Magnus is playing Nepo tomorrow and he has a very bad score against him - I think he might have a Nepolian complex”) Can Kramnik hit back against Giri? After a 5 wins to 0 record against him he’s now lost their last two classical games, including last year in Wijk. And of course, how many moves will it take before Azerbaijan colleagues Mamedyarov and Radjabov agree a draw?